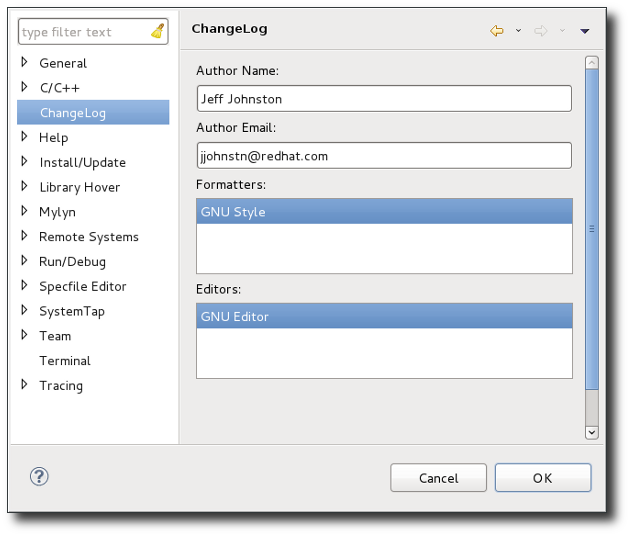 To configure your ChangeLog preferences, navigate to Window > Preferences and click ChangeLog. This will open the ChangeLog sub-menu. The name of the Author to be included in the ChangeLog entry. The email address of the Author to be included in the ChangeLog entry. The name of the formatter module Eclipse should use for ChangeLog entries. The form of each ChangeLog entry depends on which formatter module the ChangeLog plug-in uses. The ChangeLog plug-in provides a GNU-style formatter. There is an extension point by which other plug-ins may contribute alternate formatters. The name of the editor module Eclipse should use for editing the ChangeLog file.